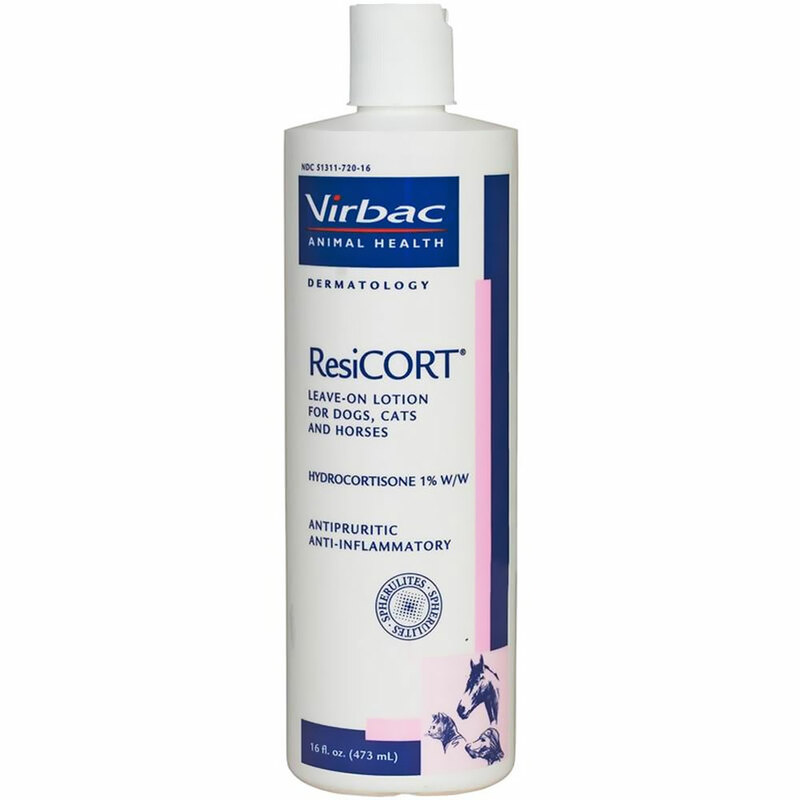 ResiCORT® Leave-on Lotion hydrocortisone is an anti-inflammatory, antipruritic (stops itching) medication. It is supplied as a lotion with Spherulites for slow-release of ingredients. How does ResiCORT® work? ResiCORT features Spherulites, and exclusive encapsulation system developed to provide slow release of ingredients, and Chitosanide, a natural bio polymer that creates a protective film on the skin and hair. Purified water, sorbitan stearate, sodium lauryl sulfate, stearyl alcohol, Spherulites, chitosanide, cetyl alcohol, cetrimonium chloride, sodium coco PG-dimonium chloride phosphate, dimethicone, DMDM hydantoin, carbomer, glycerin, triethanolamine, fragrance, methyl paraben, propyl paraben, FD&C yellow #5, FD&C red #40. May contain citric acid. Spherulites contain urea, chitosanide and glycerin in encapsulated forms. Shake well before use. After shampooing or wetting the hair coat, apply a sufficient amount of lotion to cover the entire hair coat along the back of the animal. Massage ResiCORT Leave-on Lotion well into the skin and hair coat. Apply more as needed. (Amount will vary according to the size of the animal and length of the hair coat.) May be used in localized areas or generally between shampoos. Wash hands after use. Always follow the dosage instructions provided by your veterinarian. If you have difficulty giving the medication, contact your veterinarian. What results can I expect? ResiCORT Leave-on Lotion reduces inflammation and itching. Who should not take it? Not for use in patients hypersensitive (allergic) to it or to similar products. For external use only. Avoid contact with the eyes or mucus membranes. In case of contact with eyes, flush eyes with water and seek medical attention if irritation persists. Consult with your veterinarian regarding the physical examinations and laboratory testing necessary prior to and during treatment with hydrocortisone lotion. What side effects may be seen when taking ResiCORT® Leave-on Lotion? If skin irritation develops or increases, discontinue use and contact your veterinarian. What should I do if I know of or suspect there has been an overdose? Adverse reactions and toxicities are unlikely. If you know or suspect your pet has had an overdose, or if you observe any unusual signs, symptoms, or behaviors in your pet, contact your veterinarian immediately. What should I avoid when giving my pet ResiCORT® Leave-on Lotion? Consult with your veterinarian before using hydrocortisone lotion with any other medications, including vitamins and supplements, since interactions may occur.